Many teachers of young children have experienced the frustration of not getting a correct answer, or sometimes even any answer, from bright youngsters who evidently know the right answer, but won’t admit it. I’ve seen in such circumstances a child defiantly remaining silent rather than give an answer, or even deliberately giving every possible wrong answer, steadfastly avoiding acknowledging the right one. 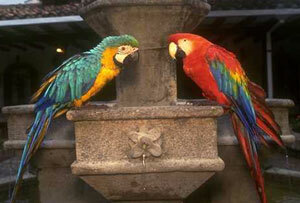 Well, it seems parrots are just the same. Professor Irene Pepperberg of Brandeis University, USA, says the results of a long-running study of parrots shows they have an impressive intelligence—about the same as a five-year-old human.1 An African grey parrot named ‘Alex’ in the study was able to correctly identify 100 objects, do simple addition and identify seven colours, just like children do. But how does Alex communicate—can parrots speak? … by chance he couldn’t do that. ‘He’ll generally perform with almost perfect accuracy for about the first maybe 12, 15 trials, and then he just does not want to do it … he’ll sit there and he’ll preen, or he’ll give me all the wrong answers in a row, which takes a lot of intelligence because he’s avoiding the one correct answer. ‘If he’s giving me six wrong answers in a row, you know he’s avoiding that seventh answer carefully. Quite so. Not by chance. Yet evolutionists claim it is by chance that the parrot ‘evolved’ that ability, and that the parrot itself (along with everything else) is the result of chance processes over millions of years.2 But the smart ‘Alex’ parrot and other documented examples of high intelligence in other birds (see, e.g., ‘Crows out-tool chimps’) highlight a problem with that idea. If chimpanzees are ‘our close evolutionary cousins’, then how is it that birds (which are not supposed to be our evolutionary cousins, and which have much smaller brains), can surpass chimps in various measures of ‘intelligence’? Unfortunately, vocal proponents of evolution such as atheists Richard Dawkins and Sir David Attenborough, obviously highly intelligent people, either steadfastly avoid answering evolutionary problems like ‘Alex’3 or else give ‘wrong answers’. Not so far different from defiant young children—and disgruntled parrots. It’s as if such evolutionists are deliberately ignoring the reality of a Creator (2 Peter 3:5) and that His Word is true. Now that’s a real shame because if only they desired to seek the truth, they would surely find it (Luke 11:9). And be rewarded accordingly (John 3:36). 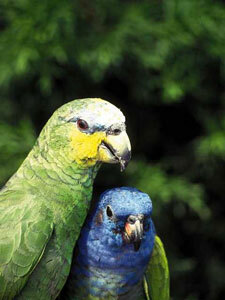 Veness, K., Parrots ‘as intelligent’ as young children, ABC News Online, 21 July 2006. Return to text. Evolutionists often protest and say it is not chance, but mutation + selection. However, they are really saying: Whatever genetic accidents happen to have come along (by chance), filtered by their ‘fit’ to whatever environment happened (by chance) to exist. Chance + chance = chance. Return to text. This is not the first time that ‘Alex’ has been in the spotlight of the news media, having been the subject of research by Professor Pepperberg for quite some years now, which we have earlier reported on. See ‘Bird-brain matches chimps (and neither makes it to grade school)’, Creation 19(1):47, 1996. Return to text.